This September, the Women in Ag Network (WAGN) is continuing our interview series featuring a woman involved in Minnesotan agriculture. Our aim is to connect you to other agricultural women across the state. Our September 2018 "Woman in Ag" feature is Allison Bastian. Allison is a recent college graduate and is starting her career in agricultural business. She balances a full-time job with farm work since she became an owner of a hog barn this past year. For many women in agriculture, myself included, this balance between off-farm and on-farm employment is a part of life. 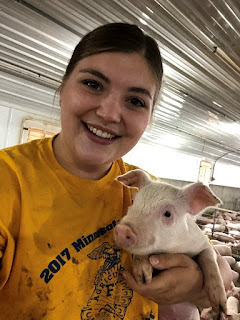 I met Allison recently when she was assisting with UMN Extension’s 4-H Livestock Interviews and I was immediately impressed with her passion for agriculture. WAGN: Tell us about your career and farm. Allison: I work for Compeer Financial in Mankato, MN where I sell crop insurance. I graduated from Iowa State University in Ames, IA this past December with a bachelor’s degree in Agricultural Business. This spring, my fiancé, Trey, and I put up a contract wean to finish hog barn. We hope to one day make farming a full-time career and to raise our own family in agriculture, just as we were raised. Trey has a bachelor’s degree in Animal Science from South Dakota State University and works at Wakefield Pork. I also help with my family’s farm where they grow corn, soybeans, and raise hogs. WAGN: Agriculture and family business can be difficult; what are some successes you've had that help you to stay positive? Allison: One thing that helps me to stay positive in difficult or stressful times is to look back on how far I’ve come. Making our dream of building a hog barn come true came with many challenges over a two year period, one being that many people didn’t believe me or take me seriously when I said this was my plan. However, to have the hog barn in full operation is such a gratifying feeling, which makes it easy to forget the challenges and hurdles. This helps boosts my confidence in getting through the next challenge to come. As Nelson Mandela said, “It always seems impossible until it’s done.” Another successful tactic is to have strong communication with those involved. Being able to articulate and share my goals, thoughts, and worries as well as to brainstorm solutions and ideas together makes for a much more efficient and less stressful process. Allison: When I was in college, a club I was involved in had a mentorship program that connected me with an industry professional in agribusiness. I still consider her my mentor. My mentor works for a large insurance company in downtown Des Moines but also farms with her husband, helps manage a side business that they own together, and is a mother, which if you ask her, is her most important job. As you can tell, I have a phenomenal and successful mentor. She enlightens me with what she has learned, things she may have done differently, and how she overcame challenges. Most importantly she is a listening ear and encourages and supports me in my goals for my professional and personal life. I share this story because having a mentor has been very impactful and helpful to me. I would encourage women in agriculture to seek out a mentor. There are many other women in agriculture who have overcome challenges and want to share their stories with other women in hopes to help them achieve their own goals. Allison: I have learned from other women in agriculture that you should surround yourself with people who make you better, encourage you, support you, and that you can learn from. I’ve also learned that I am very fortunate to be in a day and age where women in agriculture are accepted. I need to embrace all opportunities that I can for those who once couldn’t.